Cooked peas, lemon, hot vegetable stock, mint and spring onion blended into an instant pea mint soup. Quick, easy and quite healthy really. One of the recipes on the old version of twimii was easy peasy pea mint soup. Peas, cooked onions, mint and a squeeze of lemon make for a sweet and refreshing mix. I made this wanting to just have something green to put in a photo. I used spring onions – it worked out well. I have made this since. The more you blend it the better it taste and it’s definitely better to chopped spring onions rather than raw onion. This is another recipe that is the result of just trying to have a pretty pink and green dish in the background of one of the Savoury Gluten-Free Bread photos. And this one is really the star. I’m definitely going to make this anytime I need a really quick lunch. It takes minutes and it tastes good. It was just supposed to be for decorative purposes, but then I had to go and eat it. I add some fresh lemon to this. It adds that extra bit of freshness to the soup but the mint makes the dish very fresh all by itself. When I made it the first time I used a tablespoon of diced onion. Here I use spring onions (aka scallions or green onions) and while there isn’t much difference I have to admit I’ll probably use the plain diced onion in future. You might be wondering why would you bother dicing something you’re putting into a blender – it’s just to avoid finding a big lump of something that somehow escaped the blade. I use stock made with a stock cube in this recipe. If you have the homemade stuff to hand that’s even better but the instant stock is part of what makes this convenience-health-food (I think I need to turn this into a tag – done!). Regular stock cubes often contain gluten. But if you shop around you’ll find ones that don’t. I used a Kallo vegetable stock cube here and I’m happy with it. How healthy is this really though? Well it’s basically a bowl of cooked garden peas blitzed with stock, a little onion and fresh mint leaves. It’s as healthy as a bowl of peas with mint I guess. And peas are definitely good for you provided of course they suit your particular tummy. And mint, well it’s good for digestion as well as lots of other things. I use frozen peas here that are cooked in the microwave. It takes about 2 minutes. I personally think that unless they’re growing in your back garden, you’re better off buying frozen peas. And if they are growing in garden, you lucky thing, truly fresh peas taste amazing, they taste like sweets they are so sweet. I love them. But the ones you can buy in the supermarket don’t taste anything like that and I find they have more of a starchy taste than frozen peas. But each to their own. I know some people have a real problem with microwaves too. I agree that microwaves are generally awful for cooking things, they dry things out and cook unevenly. But I think they are good for some things, namely reheating cold food, cooking frozen vegetables and, in a pinch, parboiling potatoes, and I’m not convinced that they harm food, as in decrease its nutritional benefit, anymore than any other type of cooking will, but I am open to being proved wrong on that. Because I know some people really avoid using the microwave here I’m just going to say “cooked garden peas” in the recipe, cooked whatever way you like. Peas, stock, onion or spring onion, fresh mint and an optional squeeze of lemon. Put the ingredients (minus the lemon) into a blender and blend to a soup-like consistency. Add a squeeze of lemon and stir in. Taste and add more if you like or add some salt and pepper - but I find the there's plenty of seasoning from the stock cube. Enjoy! Just dump the ingredients in a blender and blend. Add a squeeze of lemon just to give that even fresher taste. I add lemon to stuff all the time – so be sure and taste this beforehand. You might like it as is. 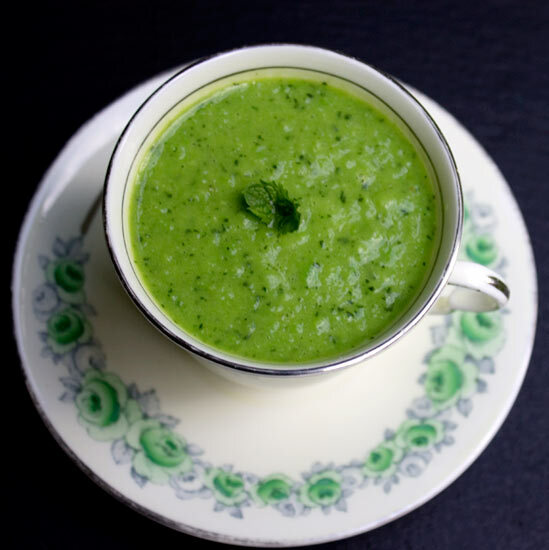 Instant pea mint soup; quick, fresh and tasty.